Very good news for violinists (and other instrumentalists) wanting to study Baroque performance practice at the graduate level: The Juilliard School will continue to offer full scholarships to all students in their Historical Performance graduate program, thanks to a $20 million gift from Juilliard Board Chairman Bruce Kovner that was announced Tuesday. The grant will fully endow the program. 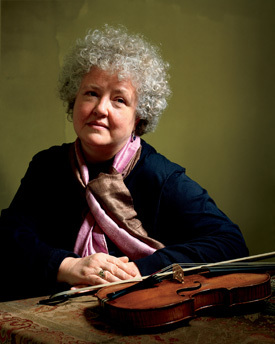 The Juilliard Historical Performance program, started in 2009 and headed by Baroque specialist Monica Huggett, right, focuses on the performance of music composed from about 1600 to the early 19th century. Juilliard Historical Performance students perform about 17 concerts annually in New York, under the name Juilliard415. Students may use their own period instruments or those from Juilliard's collection. Kovner, 66, who recently retired as chairman of the $10 billion hedge fund Caxton Associates, has been instrumental in funding the program from the beginning, according to The New York Times. Good news!!! Monica is a fantastic player!!! It is always good news when someone endows a music program with that sort of $$$. While I am not a great fan of Monica Huggett's playing, she will certainly bring heft to the program and attract good people. My relative Wanda Landowska is undoubtedly smiling from on high. I couldn't say that, Peter!